Villa Superior in the villa resort of Les Villas Ottalia. One spacious villa superior with breakfast included and private pool in Les Villas Ottalia. 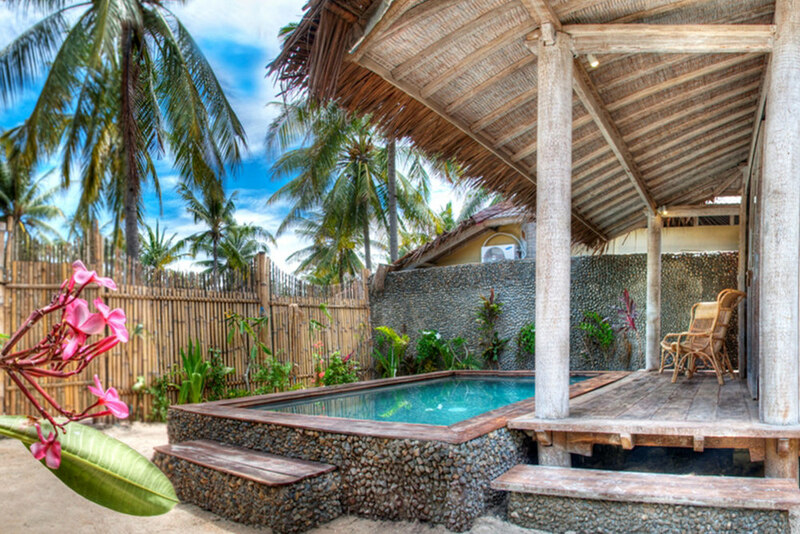 This little tropical luxury villa resort is located in Gili Trawangan and Gili Meno in Lombok. Only 5 minutes bicycle ride from the remoted beach of the island. Credit cards accepted, accessible 24/7, housekeeping included. This spacious 1 bedroom villa is exquisitely surrounded by lush tropical garden and boasts its own private pool, a separate seating area, as well as tea and coffee making facilities and minibar. The large bedrooms are all air-conditioned and fitted with an en suite bathroom featuring fresh water with hot shower facility and free toiletries. Guests can enjoy a pool and garden view from the bedroom, whilst the living room opens up to the terrace where guests can relax on the seating area and enjoy Gili warm sun. Les Villas Ottalia in Gili Trawangan, Indonesia, is a tropical luxury villa complex nested in the middle of the marvelous coconut tree fields. You will enjoy the paradise island life with all the comfort of the modernity such as private swimming pool, TV cable, fridge, safety box, high fast internet, air con unit, hot shower with fresh water. This is the perfect place to stay in Gili , our professional staff will insure that all your needs are fulfill and will be available 24h for any request.